Coots lay large numbers of eggs, and sometimes lay eggs in their neighbors' nests. Photo by B. Lyon. An adult coot can recognize its own chicks and will attack a parasitic chick that hatches in its nest. Photo by B. Lyon. The American coot is a drab, seemingly unremarkable marsh bird common throughout North America. But its reproductive life is full of deception and violence. According to biologists at the University of California, Santa Cruz, coots have evolved a remarkable set of cognitive abilities to thwart other coots that lay eggs in their neighbors' nests. In 2003, the researchers showed that coots can count their own eggs and reject ones laid in their nests by other coots. Their latest findings, published this week in Nature, show that coot parents can tell the difference between their own chicks and any impostors that manage to hatch in their nest, and they will violently reject most impostor chicks. The findings are particularly striking because so many birds seem to be unable to recognize the chicks of species such as cowbirds and cuckoos, which always lay their eggs in the nests of other birds. This behavior is called brood parasitism, and its success has posed a longstanding challenge to evolutionary theorists. "When you see a little songbird struggling to feed an enormous cowbird chick, you have to wonder why it can't recognize the parasitic chick when it is so obvious to us," said Bruce Lyon, professor of ecology and evolutionary biology at UCSC and coauthor of the paper. "The coot study shows that chick recognition can evolve, even when the chicks are the same species and all look the same to us." The researchers found that coots learn to recognize their own chicks each year by using the first-hatched chicks as a template to which other chicks are compared. This learning mechanism may explain why it is so hard for chick recognition to evolve among the hosts of cowbirds and cuckoos, said Dai Shizuka, a UCSC graduate student and first author of the paper. "Cuckoo and cowbird chicks tend to hatch before the host chicks, so their hosts can't use hatching order as a cue for chick recognition," Shizuka said. "As long as recognition has to be learned, you run the risk of learning incorrectly, and that could be the bottleneck." These findings provide indirect support for a theory proposed by Arnon Lotem of Tel Aviv University, who attributed the absence of chick recognition in most cuckoo hosts to the high cost of mistaken imprinting. By experimentally causing mistaken imprinting in coots, Shizuka and Lyon confirmed that learned chick recognition does have potential costs. Lotem assumed a classic imprinting mechanism that would occur only once, during the adult bird's first breeding season. Coots, however, seem to "imprint" on their first-hatched chicks each year. Coots reliably imprint on their own chicks because the first-laid eggs are the first to hatch, and parasitic eggs are deposited only in nests that already have eggs in them. "It's not that coots are exceptionally smart. They just have reliable information that allows them to do what we expect all hosts 'should' be doing to defend themselves against parasitism," Shizuka said. The common cuckoo and brown-headed cowbird are specialists in brood parasitism, shifting the burden of parental care onto other species rather than building their own nests. In coots, brood parasitism seems to be an optional component of a reproductive strategy based on laying large numbers of eggs. Depositing a few eggs in a neighbor's nest is just another way to increase the number of potential offspring. 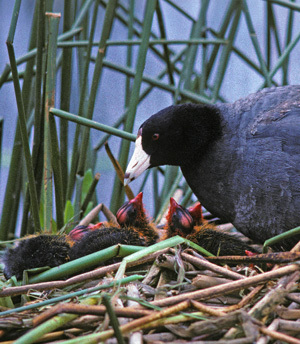 The chances of survival in a neighbor's nest may be slim, but coots habitually lay more eggs than are likely to survive, Lyon said. Only in the best of years is there enough food for all of the chicks; in a typical year, about half of the chicks in each brood starve to death, he said. 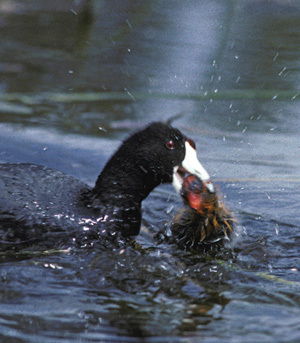 If a parasitic chick survives, another chick in the brood must die, which explains why coots have evolved such strong defenses against parasitism. "We actually set out to study how coots bring their brood size into alignment with the availability of food, and what role hatching order plays in the culling process. But we kept seeing anecdotal evidence in the field that something else was going on," Lyon said. "With the parasitic chicks, they don't just let them starve, they attack them with a viciousness we hadn't seen before." The researchers got a one-year extension to their grant, funded by the National Science Foundation, to study chick recognition at their study site in British Columbia. The experiment required removing eggs from the nests at the pipping stage (when the chick starts trying to break the shell) and hatching them in incubators. This allowed the researchers to tag the chicks and record which eggs they came from before returning them to the nests in a controlled sequence. In one set of nests, the parents got their own chicks back on the first day. After that, chicks were returned to the nests in pairs consisting of an unrelated chick and a chick that belonged to the parents. The unrelated chicks were all siblings. In a second set of nests, the first chicks returned were not related to the parents, after which chicks were returned in pairs as in the first set of nests. In all cases, a chick's chances of survival were highest if it was returned to the nest on the first day or was a sibling of the first chicks. If the first chicks were unrelated to the parents, the parents would favor them and their siblings and drive off their own chicks. "The parents learn the first chicks they start taking care of as their own, and base their decisions about later chicks on that," Shizuka said. Using first-hatched chicks as the basis for recognition will be adaptive only if there is a low probability of parasitic chicks hatching first, he said. In a search of the scientific literature, Shizuka found two recent examples of birds, both in Australia, that appear to be able to recognize and reject cuckoo chicks. He said he hopes to learn more about those species and find out how they compare to coots. The researchers also want to find out what cues coot parents use to recognize their chicks. The possibilities include smell, vocal calls, and visual cues such as plumage. "Those are all plausible hypotheses, but we don't know yet," Shizuka said.